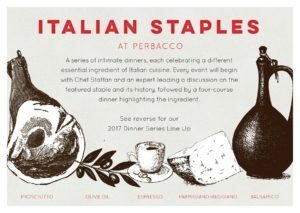 The 2017 line up is set for our new dinner series, Italian Staples at Perbacco! Each intimate dinner will celebrate a different essential ingredient of Italian cuisine. The next event is coming up Wednesday, November 15 and will feature Espresso. The evening will begin at 6:30pm with a tasting of espresso, a selection of hors d’oeuvres, as well as a discussion with Chef Staffan Terje and an expert from local roaster, Mr. Espresso. The group of 16 guests will then sit for a four-course dinner showcasing Espresso in a variety of dishes. This unique experience is priced at $75 per person (excluding tax & gratuity) and there will be an optional wine pairing available for $35. To make reservations for this dinner or the whole series, please contact Stephen Lee, Director of Hospitality & Private Dining: 415-955-0647 or stephen@perbaccosf.com. You’re invited to join us for the 12th annual Italian Passover at Perbacco. Chef Staffan Terje and Umberto Gibin will be collaborating for one special evening on Monday, April 22nd…. Join us for Eat Drink SF – San Francisco’s premier annual food, wine, and spirits festival that celebrates the Bay Area’s world-class chefs and restaurants. At the Saturday evening grand tasting on Aug…. Perbacco will be closed on Monday, May 28 in observance of Memorial Day. We will see you all the following day for lunch. White Truffle Season at Perbacco! Join us at barbacco on Tuesday, November 15 for the second event in our series of monthly prix fixe pasta dinners. Festa dei Tartufi Bianchi – White Truffles at Perbacco!